The 2018 United States House of Representatives elections in Nebraska were held on Tuesday, November 6, 2018, to elect the three U.S. Representatives from the U.S. state of Nebraska; one from each of the state's three congressional districts. Primaries were held on May 15, 2018. The elections and primaries coincided with the elections and primaries of other federal and state offices. The 2018 elections saw all three incumbents elected (all from the Republican Party), thus the GOP retained control of all three House seats. The incumbent is Republican Jeff Fortenberry, who has represented the district since 2005. He was re-elected with 69% of the vote in 2016. The incumbent is Republican Don Bacon, who has represented the district since 2017. He was elected with 49% of the vote in 2016. Brad Ashford, former U.S. representative for the 2nd district. The incumbent is Republican Adrian Smith, who has represented the district since 2007. He was re-elected unopposed in 2016. ^ Walton, Don. "Fortenberry challengers hope to ride a Democratic wave". JournalStar.com. Retrieved 2018-04-15. ^ Georlett, Pierce. "Jessica McClure Running for First District in Nebraska". Retrieved 2018-04-15. ^ "Nebraska Primary Election Results". The New York Times. Retrieved May 16, 2018. 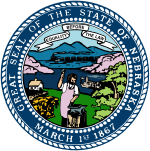 ^ "Nebraska Secretary of State Election Results". Retrieved May 16, 2018. ^ writer, Robynn Tysver / World-Herald staff. "Nonprofit executive Kara Eastman will seek Democratic nomination in 2nd Congressional District". Omaha.com. Retrieved 2018-04-15. ^ Editor, MIKE KONZ Hub Managing. "Democrat candidate Paul Theobald: Trump setting table for GOP loss in 3rd District". Kearney Hub. Retrieved 2018-04-15. ^ Star-Herald, JERRY PURVIS. "Alliance man runs for Congress, challenging Adrian Smith". starherald.com. Retrieved 2018-04-15. ^ KHGI. "Meet the candidate: Third Congressional District Arron Kowalski". KHGI. Retrieved 2018-04-16. ^ Reporter, ERIKA PRITCHARD Hub Regional. "Congressional candidate Kirk Penner has Main Street mindset". Kearney Hub. Retrieved 2018-04-16.